We’ve scrimped. We’ve saved. We’ve searched far and wide. At long last we’re here- The Country. Whether our Country is 100 acres in the center of the middle of nowhere, or nestled among other small homesteads of a few acres each, we take very seriously the stewardship of this precious land we have chosen to call Home Sweet Home. Learning and/or perfecting farming crafts and skills? Absolutely. Self-sufficiency is the core of the Apple of Homesteadery. Duh. A few of us are settling virgin acres miles from conventional power, while most of us are building reasonably close to utility hookups or renovating old farmhouses with varying degrees of modernization. The former group of Homesteaders has no choice- alternative energy is thrust upon them, and they have my undying admiration. Their task is huge, their dedication to the “simple” life inspiring, mainly because there is nothing simple about it. I belong to the latter group, those of us who unthinkingly turn on the tap and water comes out, flip a switch and lights come on, adjust the thermostat and feel comfortable. We must consciously choose between conventional consumption and alternative, possibly less convenient but undeniably more Earth friendly utility options. My family is at the point of choosing, and although we have never been accused of being “normal” or “average”, I believe our findings and plans match many other contemporary Homesteaders’. If you are looking for a really good, technical article on the science of photovoltaics, there are hundreds of them on the web and whole shelves of books devoted to that, but this ain’t it. I don’t necessarily need to know how this stuff works, I need to know why it will work for my family and our tiny fragment of Earth. This is one country gal who barely made it through high school science trying to gather enough basic knowledge to make sense and make a difference. 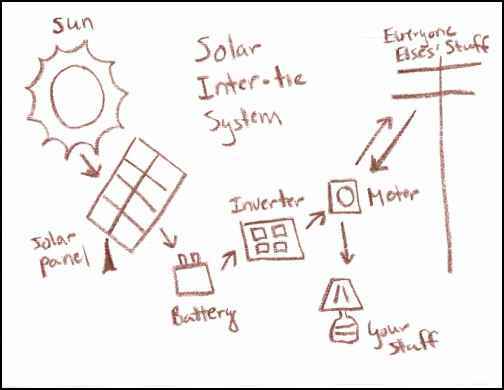 Energy from the Sun is collected by solar panels. It’s transported to batteries that store it, and from there it goes to an inverter that turns it into usable, garden variety electricity. It then travels a) back into your house to power your stuff, or, in an inter-tie situation, b) back through the meter (which will run it BACKWARDS) and into the grid to run other peoples’ stuff. Our current utility situation includes city water, city sewer, conventional electric and natural gas hookups. Next, we needed to look at our existing electrical usage (egads!). Using a handy worksheet I downloaded from RealGoods, we ascertained that during our high-usage months, we use just shy of 80,000 watt hours per day, or 2,400 kilowatts per month. This was verified by looking at our electric bill. Oh sure, I could’ve just looked at the bill and saved myself several hours lookin’ under and behind stuff with my reading glasses, a flashlight, and a large shoe to squash creepy things, but the worksheet itemizes and highlights the powerhogs. (Plus I now know where all the dustbunnies go when they die). For a system to power our current house at our current usage using our high month figures, we would need to write a check for right around $100,000. Hmmmm, we need a Plan. This is obviously not one of those projects that can be tackled of a piece (unless I’m holding the winning Texas Lottery ticket). STEP ONE: we need to TURN STUFF OFF. I was assured that our electric usage was pretty standard for a house of our size, but that only made me feel worse, because I thought we already DID use less electricity than most folks. Just paying attention and turning stuff off will cut our usage by about 15%, according to Stephen the Technician at RealGoods. STEP TWO: upgrade/eliminate our appliances. We don’t use some of the watt guzzlers anyway- hair dryers, curling irons, coffee makers; but our water heater was old when we bought the house, so no telling it’s exact age, and from the faded label on the side, uses a whopping 4,500 watts of electricity. Granted I’m a terrible laundress and only wash in cold water, we don’t have an automatic dishwasher (well, sort of- my wonderful husband gets up from the dinner table and automatically does them), and we all take short showers in the morning, but DANG. So Mr. Water Heater is first on the appliance Hit List- my husband has been drooling over the tank-less super-efficient ones at the Home Depot for several years anyway. Our other appliances are not too bad. Our fridge and freezer are both 1/3 smaller than most folks’ and under 5 years of age. Our little apartment sized dryer, bless it’s heart, was a reject from the clinic I manage when they upgraded to a full sized model, but since it’s smaller, uses less than half the watts of a full sized dryer. Our washer, handed down to me used when my 18 year old son was still in cloth diapers, will have to be replaced also, but not mainly as an electrical issue, but a water one- our plumber estimates it’s using almost 50 gallons per load. The kicker of course, is that these trusty old appliances are STILL WORKING. I guess there’s something to be said for replacing them BEFORE they screech to a halt, but I’m still from the “You don’t buy new, you make do” generation. Replacing our appliances with new efficient ones will shave another 35% from our usage, taking us down to half our current consumption without touching a solar panel, battery or inverter. STEP THREE: we can address the solar installation in stages, starting with enough panels to produce about 1/2 our needs, during most months, and build up from there. You can, if you are a do-it-yourselfer, climb-on-the-roofer, not-askeerd-of-high-voltager, put together your own solar system, buying piece by piece the panels, batteries, inverters and whatnots OR you can find a company who’s been doing this for years and has pre-packaged units that are slightly altered according to situation, who come to your house and install the whole shebang (Howdy, come on in, I’ll whip up a fresh batch of tea. Sweet or Unsweet?). Now, since we already have electricity, courtesy of TXU Electric, a tie-in system just makes sense. If we have rain for a week like we did back in June and we deplete our stored power, the system will shift to TXU electric so seamlessly (supposedly) that only our computer will notice it. If we are making more than we can store, the surplus power gets washed back into the Grid and our meter runs backwards (I want to SEE that)! There is a disconnect option, so anytime we want to, we can completely cut off from the Grid and be a free-standing entity. After chatting with Phil at Solar Installations in Dallas, who has been in the solar business for over 20 years, I was assured that he has installed systems for folks using our electric company, and after he educates them some, they have always gone ahead and installed a net meter. Well, Class, what have we learned? We have learned something that our friends Homesteading in the Boonies already know- we need to THINK about where stuff comes from. We are so removed from the sources of everything, even those of us growing our own fruit and veggies (turn on the sprinkler and water comes out, cook and can on the stove, store in the freezer), raising our own livestock (electric fencing, lights for those early morning and winter evening feedings, tank heaters for the Snowbirds), and working those Homestead Crafts and Skills (power tools and tractors anyone?) need to sit up and take notice. If we pay more attention to our consumption, and take steps to be responsible for our own power production, we will pay less to Reddy Kilowatt, and simultaneously pay into our children’s healthy future on a healthy planet.